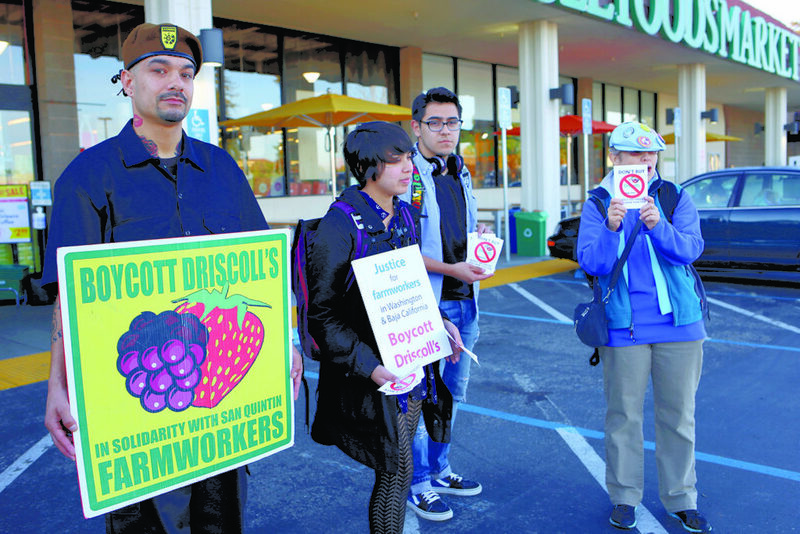 A protest against Driscoll’s, the world’s largest berry producer, occurred in Santa Cruz on Friday with about 10 people holding signs outside Whole Foods on Soquel Avenue. Driscoll’s, headquartered in Watsonville, is the subject of a boycott that began in 2015, when employees of two Driscoll’s suppliers reported alleged poverty wages, wage theft and sexual harassment. Friday’s protest aimed to put pressure on Whole Foods to stop selling Driscoll’s berries. “We’re all in this together. When you protect the farmworkers, you protect the consumer,” said Michael Garcia, a protester and member of the Watsonville Brown Berets, though he wasn’t representing the organization. The Watsonville Brown Berets is a Chicano-based community organization based on the Brown Berets group that emerged during the 1960’s Civil Rights movement. “We’re fighting against the exploitation of our people, and we’re fighting for the farmworkers who are striking in San Quintín [Baja California] and Washington,” he said. Since 2013, Driscoll’s has been under fire after Sakuma Brothers — its Burlington, Washington supplier — was accused of mistreating its workers that same year. Sakuma Brothers allegedly paid workers below the minimum wage and provided unfit working conditions, although it denies the allegations. In 2015, BerryMex, the San Quintín supplier, was accused of unacceptably low wages, sexual abuse of female employees, and not providing benefits and overtime pay. “We are disappointed that Driscoll’s continues to be unfairly targeted with secondary boycotts and dissemination of misinformation,” wrote Soren Bjorn, executive vice president for Driscoll’s of the Americas, in an email. Driscoll’s CEO Kevin Murphy responded to this misinformation in a statement to KION in January saying protesters falsely accused the company of child labor, abuse of workers and the extent of its use of pesticides that are found to cause health problems. After the allegations were made, Driscoll’s updated its worker welfare standards and launched a program with Fair Trade USA to sell Fair Trade Certified organic strawberries and raspberries from Baja California. These standards follow international criteria, and include zero tolerance policies for child labor, forced labor, human trafficking, harassment and health and safety conditions that pose immediate risks. Following the farmworker strikes against Sakuma Brothers and BerryMex, the workers formed independent unions — Familias Unidas por la Justicia (FUJ) in 2013, and Sindicato Independiente Nacional Democrático de Jornaleros Agrícolas (SINDJA) in 2015. Last year, FUJ expanded its boycott of Sakuma Brothers to include one of its largest clients — Driscoll’s. Gasser and protester Michael Garcia hope the boycotts will pressure Driscoll’s to negotiate with the unions and address their concerns. The group of protesters outside,of Whole Foods are hopeful their local boycott will be part of a gradual shift in the culture toward protecting worker rights. Familias Unidas por la Justicia will tour the Bay Area from March 26- April 1 and will be in Santa Cruz on March 30.